I am encouraging all SLU Law readers of this blog to show up tonight and support the Black Law Students Association at their fundraiser at Cold Stone Creamery. There should be a coupon in your school mailbox that you will need topresent when ordering your ice cream, and BLSA will receive a portion of the proceeds from your order. The event runs from 5:00 - 10:00. And don't let concern over calories keep you away - they have something called Sinless Sweet Cream that is low-calorie and fat free. Bonus for ACS members: If you show up between 7:30 and 8:00, ACS will pop for your ice cream. As promised, here is the information regarding the upcoming ACS discussion of the living constitution. What: ACS Brown Bag Discussion. When: Tomorrow, Tuesday, February 21, 2006 at noon. Who: Professor Bloom and anyone else who'd like to join us. Why: To learn more about the idea of a living constitution. Bring your lunch, we'll supply cookies. 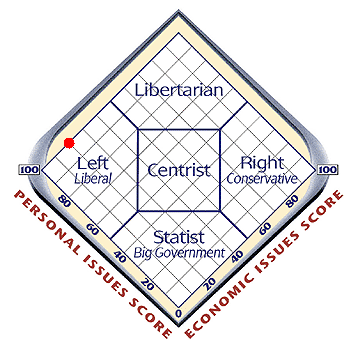 This is my result in "the world's smallest political quiz." I'd be interested to learn of the results of some of my readers, so if you're so inclined, take the quiz and post the results in the comments. Justice Scalia (and some of my classmates) may believe that those who espouse a living Constitution are "idiots." But I'm hard pressed to think of anyone who could accurately call Professor Bloom an idiot - so the timing is pretty impeccable that he'll be speaking to ACS in a brown-bag setting sometime soon on this very topic. Once the time and date are firmed up, details will be posted here. One night last week, I actually managed to get home in time to catch The Daily Show, and one of the stories featured not only my home state but a town not too far from where I live. The subject was the growing controversy over pharmacists refusing to fill prescriptions for birth control pills - most often emergency contraception. The pharmacist they were interviewing was Ron Stephens who also happens to be a state representative from nearby Bond County, Illinois. Governor Rod Blagojevich - who has taken action to ensure that Illinois women have access to the medications their doctors prescribe them - was also on the show. That's all I've got for now. I'm suffering from a pretty intense cold/flu/sinus sort of thing so I've been engaging in such luxuries as actually sleeping more than 5 hours a night. I'll be getting back to that right about now. Tonight I attended a Super Bowl party at a classmate's home. I'm not a fan of football, but I'm a fan of my friends and don't get to see them that often, so I went. The hosting classmate has a roommate who's originally from India and used to live in San Francisco. He couldn't get over the "Jesus commercials" (as he put it) featuring Kurt Warner that kept playing. After perhaps the third showing, he said, "This must be a St. Louis phenomenon. No way is this playing all over the country." So he got on the phone to some friends of his out in the city by the bay. The conversation went as follows. Roommate: "Are you watching the game?" Roommate: "Did you just see the last commercial they played?" Roommate: "Was it Kurt Warner doing a spot for something called Athletes For Jesus dot org?" SF Friend: "No, it was for Brokeback Mountain." If anyone has a defense for this, I'd love to hear it. The following is a letter written by anti-war activist Cindy Sheehan regarding her experience at the State of the Union Address Tuesday night. Taken from Common Dreams.